My vision board required no venn diagrams or rough draft to create. However, I did think thoroughly about how I would create it and how to make it unique to my website. I clicked open Adobe Photoshop CS6 and jumped into the design process. I was able to narrow down the focus because I wanted it centered around journalism and I peppered my interests throughout the board. I made sure to make the aspects of journalism stand out the most, hence the newspaper clippings. I will explain some of the key points on my vision board. 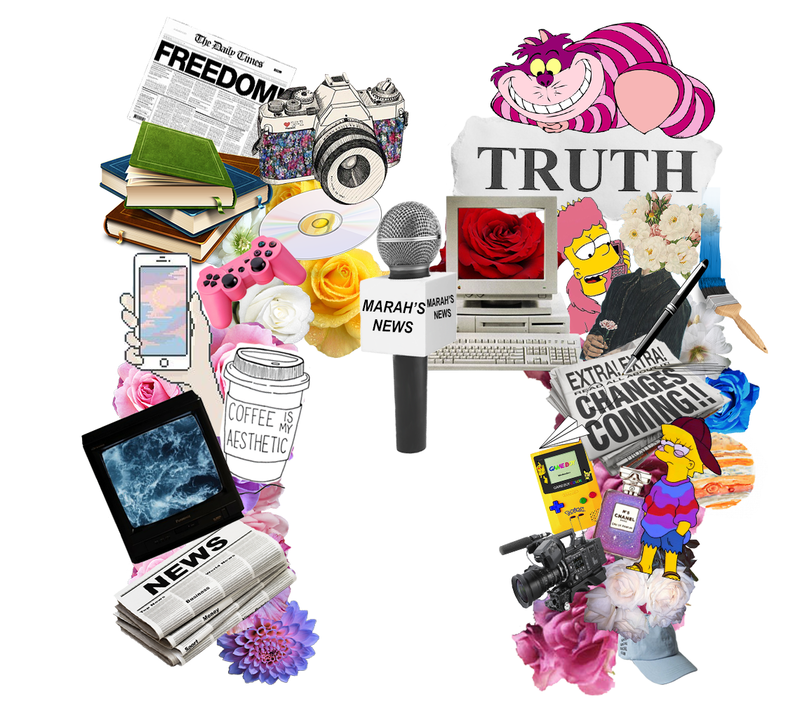 News, freedom, truth, and changes are words encompassed with multiple significant meanings. I am interested in the concept of technology and nature. Two contrasting parts of our world that are at a constant struggle with each other. With the flower as a symbol for nature I placed the delicate, colourful images within the cold, hard places of technology. Lastly, I will discuss the image that immediately occupies the viewers gaze, the Cheshire cat who rests upon the truth. The wonderland creature is a web of metaphors. Famous for its mischievous grin, the cat represents madness, philosophy, and truth. He says things to Alice that make her think twice. He is aware of his madness and accepts it. Be the first to comment on "How to create a Vision Board"